Android Police reports that it was able to get a hold of some Android N screenshots way ahead of Google I/O when the developer previews should be released. Since the screenshots were not allowed to be reposted, there were a few mockups which roughly describe the alleged changes in for Android. Along with different looking app notifications in the main notification shade, there is a row of quick toggles just under the status bar which reminds us of the Ice Cream Sandwich days. 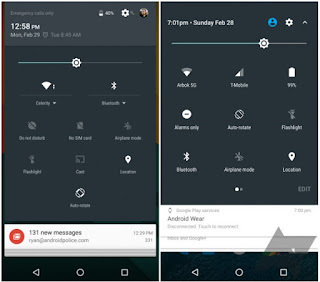 These mockups are reportedly based on early Android N screenshots and could vary by the time the developer previews are available for all to download.